100+ days. Capsicum chinense. Open Pollinated. 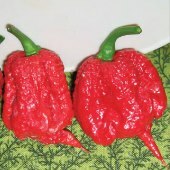 Plant produces good yields of 2 ½" long by 1" wide by hot peppers. 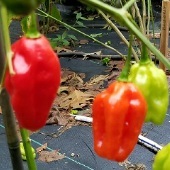 Peppers are extremely hot and turn from green to orange when mature. Plant has dark green leaves, green stems, and white flowers. It is said to produce the best taste when orange. One of the five hottest peppers in the world. 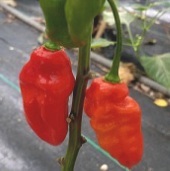 Try growing the Naga Jolokia, the Dorset Naga, the Bhut Jolokia, and the Naga Morich. A variety from India. Scoville Heat Units: 1,000,000.